A nice start to the Premier League season this weekend with plenty of new signings making their mark including our tip for top scorer honours Roberto Soldado, Simon Mignolet in goal for Liverpool & Ricky van Wolfswinkel for Norwich. It wasn't too bad for us on a betting front either with Rickie Lambert sealing a perfect 2 out of 2 with his last minute penalty to bring up the Southampton draw no bet winner to add to West Ham's impressive home victory. We're keen on both sides to have good seasons, Southampton have landed the striker they very much needed to help loosen Lambert's load with the capture of Roma's Pablo Osvaldo & West Ham can challenge for a top 7 spot if continuing their excellent home form from last year. Here though we're going to take our first look at Monday Night Football for this season with the dysfunctional Newcastle United travelling to take on Manuel Pellegrini's new look Manchester City side in a game that is important for City to win if they're to lay down a marker of their intent. Manchester City certainly signalled their intent at the end of last season with the removal of Roberto Mancini, his backroom staff & the superbly talented but troublesome Carlos Tevez (with Balotelli also departing 5 months before). They've signed players who're at the age & performance levels that they should be able to contribute straight away & all seem to fit areas of the team where upgrades could've argued to have been needed - it's a strategy that other clubs seem to have failed at (United & Arsenal failing to sign anybody & Chelsea seeming to sign players in just one position - they now have 732 creative midfielders...). Spending just £14.9m on Jesus Navas looks an inspired bit of business in today's extortionate market as the winger has bags of pace & offers genuine width that City lacked previously. Navas will be able to link up with Negredo straight away (they both came from Sevilla) & he'll find the underrated Edin Dzeko a superb target to cross to also. 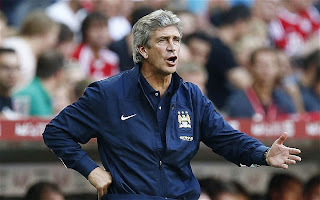 Pellegrini has been tasked with getting his side to play more attractive football than they sometimes did under Mancini & also to get some success in Europe compared to their humiliations over the past two years & he'll view a home match against Newcastle as a good opportunity to begin. City should have a more attacking philosophy than last year & although they may concede a few more (they were the meanest in the league in 2012-13 with 34 conceded) they won't mind that if they can turn a few draws into wins. We'd say it was more the strategy than the personnel which contributed to City's good defensive record as we're not keen on Hart in goal & although Kompany & Zabaleta are stars we're not so sure about Clichy at left back or whoever they pair Kompany with. Gareth Barry looks to have lost his place with loan deals mooted & that should mean a pacey, scary lineup in this game with the freakishly powerful Yaya Toure & the delightfully talented Fernandinho likely to prove too much for Newcastle to handle in the centre of the pitch. Cheick Tiote's form dipped considerably last year & James Perch lacks the necessary quality, whilst the promising youngster Gael Bigirimana would find this a big ask - they could struggle to both win possession & keep it here & that will strangle the supply to their key attacking players of Gutierrez, Ben Arfa & Cabaye. Newcastle's off-field issues have been commented on plenty & the problem we see from the off is that they underperformed last season yet haven't been able to do much business in the transfer market to attempt to rectify that with just the minor signing of Oliver Kemen ( a French midfielder surprise, surprise) & the loan signing of Loic Remy coming in so far. They struggled on the road last year with just two league wins (against QPR & Aston Villa) & the lack of firepower without Demba Ba particularly hurt them meaning draws tended to be the aim. That does mean they're used to trying to frustrate opposing sides & they've two very good defenders in Collocini & Santon plus a decent keeper in Tim Krul. The problem is as noted above that they probably won't have too much protection in front of the back four & their other defenders lack a bit of real quality with, for our money, Steven Taylor being a particularly poor player to have played so many Premier League seasons. To be fair Mathieu Debuchy only joined last January & he may well be bedded in now & he's certainly a step up on Danny Simpson at right back. This could be a long night for Newcastle & we've a feeling that City will come bursting out of the blocks in this one & could take a grip of the game early on, with that in mind the 9/10 that BetVictor (fast becoming our favourite bookies for football betting) offer for a Man City half time/full time result is the suggested punt. City managed that in 9 of their 19 home games last season & although that suggests odds on isn't a fair price Newcastle are a weaker side than many & poor travellers. The other selection is contingent on him being in the starting lineup & that is Stevan Jovetic anytime goalscorer at 7/4 - the skillful Monetengrin knocked in 27 goals in 58 league games for Fiorentina over the past two years & that's pretty close to the magic 1 in 2 so the odds are very fair.